If you've been paying attention, you've seen this coming for some time now. There is a powerful shift going on in some of our schools - and outside them as well. As our students get their hands on Internet connected devices, they aren't simply able to accomplish the often menial tasks that we adults dole out to them. They also discover that they are now connected to the accumulated knowledge of the entire human race. They are also infinitely connected to one another, with unprecedented access to the simultaneous learning shared by their peers. This change has fundamentally altered the way that we learn in a digital world, and it is changing the way connected schools do business. 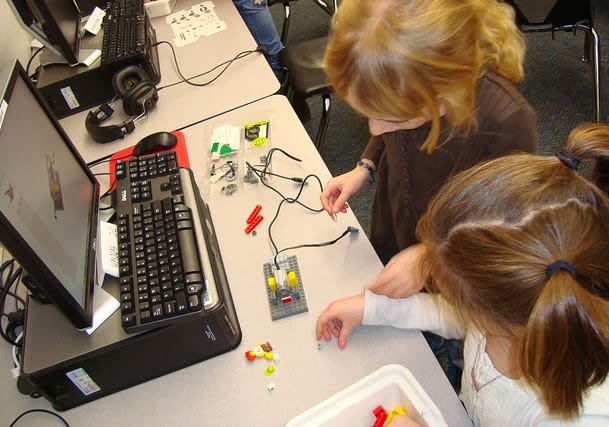 The concept of a 'connected learner' is an idea whose time has come. This week I saw some powerful examples of this in my visit to the leadership summit of the State Educational Technology Directors Association (SETDA). This gathering is always a fantastic opportunity to learn from the technology leaders of each state, share the tremendous things going on here in Indiana, and also glimpse new technologies and ideas that are on the horizon. However, the annual highlight of this event is usually...the students. 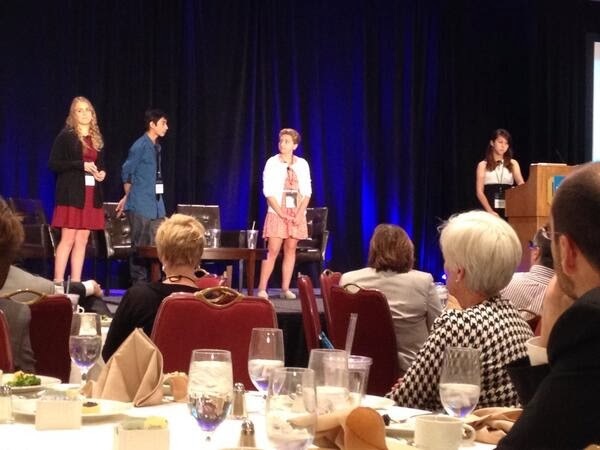 This year, we featured a talented group of students from Raleigh Hills K-8 School in Beaverton, Oregon. These young leaders flew across the country to Washington D. C., took the stage in front of hundreds of state and corporate leaders, and they left us in awe. Led by a passionate technology coordinator named G. Douglas Bundy, this group of students has created StudentSource, a simple Google Site where they have accumulated games-based interactive modules and shared them in more than 5 million lessons! As I watched their presentation, I not only marveled at the confidence of these 8th graders in front of this audience, but also wondered at the depth of their thought as they evaluated which modules would be most appropriate for their kindergarten peers. 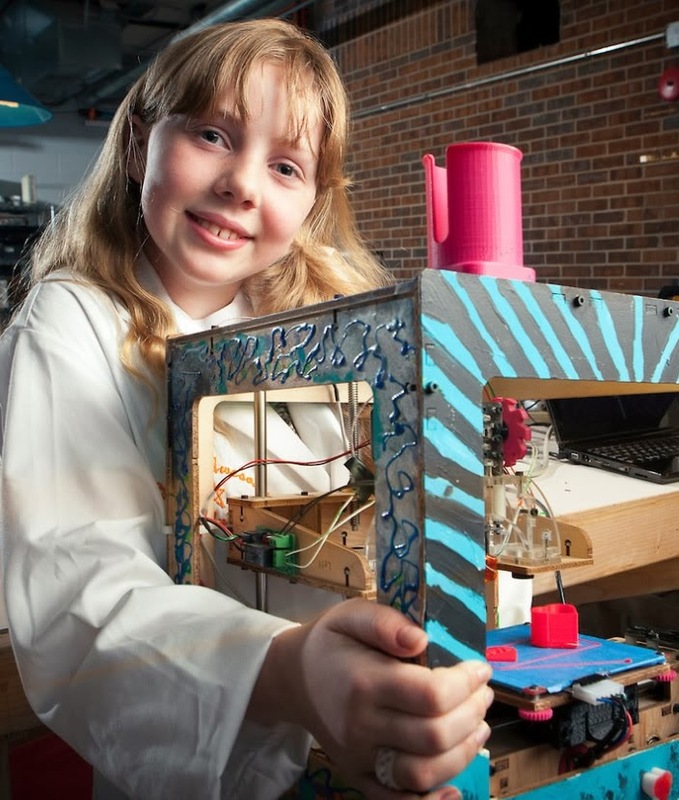 These young people, inspired by one teacher, and empowered by technology, are truly remarkable. This year Oak Hill's sixth grade eLeaders presented at our state conference, as well as the conference of the International Society for Technology in Education (ISTE). Indiana also has student groups like Plymouth's eLearning Rockstars, GSHS Student Technology Corps and Madison's Digital Leadership Class who collectively hosted a Twitter chat for teachers across the state! You can find a transcript of their chat here. And if you are paying attention, you see the work of these connected learners outside of school all the time! They are Super-Awesome Sylvia, and Jacob Collier. 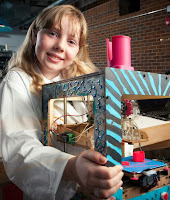 Talented kids like these are the heart of the Maker Movement and they hold immeasurable potential. More importantly they are your son and my daughter, who prove daily that they can learn to do anything from a simple YouTube video. What truly had an impact on me was the knowledge that students just like these are sitting in our classrooms every day. Can you imagine what we would have missed if someone had simply asked these students to be quiet and finish their vocabulary list? Can you feel the deficit that occurs when we try to wall them off from tools like Google Apps or even Twitter, because a few others may abuse the privilege? At this event, Kristen Amundson, Executive Director of the National Association of State Boards of Education (NASBE) made reference to recent news coming from very public iPad deployments where students had gone around the district firewalls. Her response was "Don't punish them, hire them!" In light of these examples, I hope you will join me in reflecting on the work we do. Are we empowering these students to be amazing in our classrooms, or are we working to hold them back? 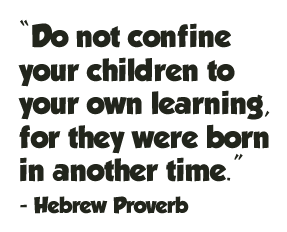 Are we working with them to create new models, or are we still expecting them to conform to the version of school that we experienced? And when we place powerful devices in their hands, are we asking them to show us what they can do, or are we confining them to that which we know? The world continues to get smaller, and some days you can actually feel it happening. We're nearing the end of a Connected Educator Month that has lived up to its title in the State of Indiana. Educators with a passion for improving their craft have sought one another out, and are empowered at a new level through the connections they have made. Specifically, members of this highly connected community have shared their stories, read books together, pinned their resources, and engaged in some fantastic conversations. Did I mention that this tight-knit group is spread across some 36,000 square miles? This month has been an awesome demonstration of the value of digital communities, and it also makes a fantastic backdrop for starting a new collaboration. We know that with the advent of 1:1 learning environments, one of the most pressing needs is for quality, embedded professional development. To help teachers and administrators envision and achieve new models of learning in our classrooms, eLearning coaches - talented educators skilled at integrating technology - have been a vital piece of the puzzle. Naturally, as more and more technology finds its way into our schools, districts large and small are adding coaches to ensure that it is not only adopted, but also implemented in thoughtful ways. A few months ago we sought out the names and emails of the educators currently in these roles, and the response was overwhelming. We had more than 130 immediate responses, and the majority of these were just assuming the role this school year for the first time. It became instantly apparent that this was a group eager to connect with one another. Yesterday, we gathered 20 representatives of this group in a room donated by Project Lead the Way, and we discussed the tremendous potential of this group to share resources and professional development ideas. It was a very exciting start to something that has great potential to unify our efforts. 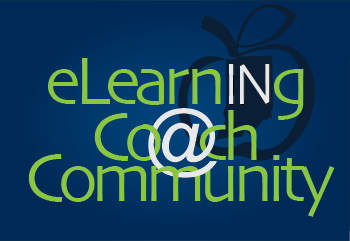 If you are working in the capacity of an eLearning coach or technology integration specialist, you won't want to miss the opportunity to connect with this group. While we've gathered information in a number of ways - we'd encourage you to put yourself on the map so that the group can connect with you. Exciting times are ahead! Even as I write, members of this community are taking it upon themselves to build a Google+ community, establish a listserv, and plan a larger gathering of all our coaches. Just imagine what might be envisioned as this collaboration spreads to more than 20! Can you feel the world getting smaller? EdWeek’s “Superintendent Take to Twitter to Kick Off School Year” inspired us to draft our own Indiana take on the post as a way to recognize some of those leaders who have realized the potential of Twitter to build connections. You can find all of these superintendents as well as other administrators on our Twitter List IN Administrators. 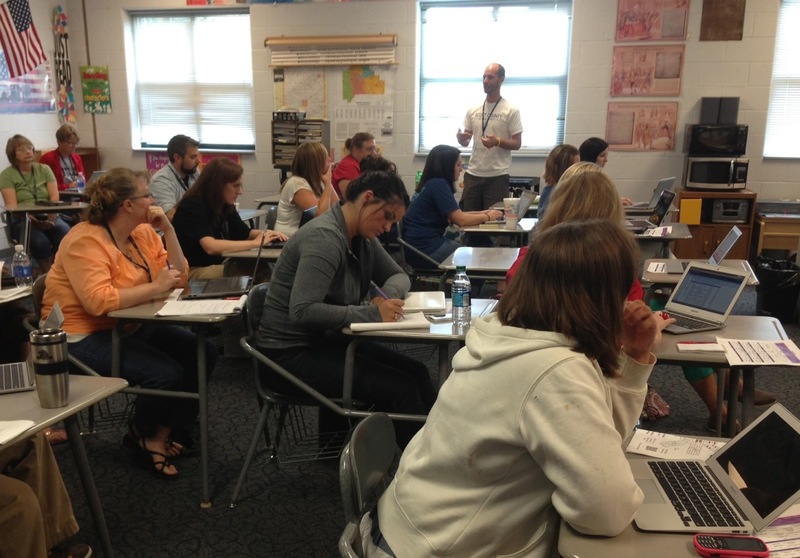 For many Indiana educators, back to school preparations began with learning at one of the Summer of eLearning conferences. Several district superintendents abandoned any traditional figurehead roles at these events and could be seen in sessions engaged in rich dialogue about transforming learning. If you followed the various conference hashtags, you could find many district leaders highlighting their takeaways from sessions, such as Plymouth Community School Corporation Superintendent Daniel Tyree. Greater Clark County Schools Superintendent Andrew Melin and his faculty were immersed in new thinking and new tools as they prepared to rollout their 1:1 initiative. He modeled the change in his initial tweet seen here. When the first day of instruction drew closer, districts began holding their back to school events for teachers. We saw a number of tweets being sent out from auditoriums and gymnasiums across the state as leadership shared their district’s vision and welcomed new and returning teachers. Jason Callahan, Superintendent of Wabash City Schools demonstrates how Twitter allows us to extend the exchange and make personal connections. Superintendents are paying attention to faculty and staff tweets. You can tell that they follow their district and school hashtags. It’s not unusual to come across a leader retweet of something shared by a classroom teacher. 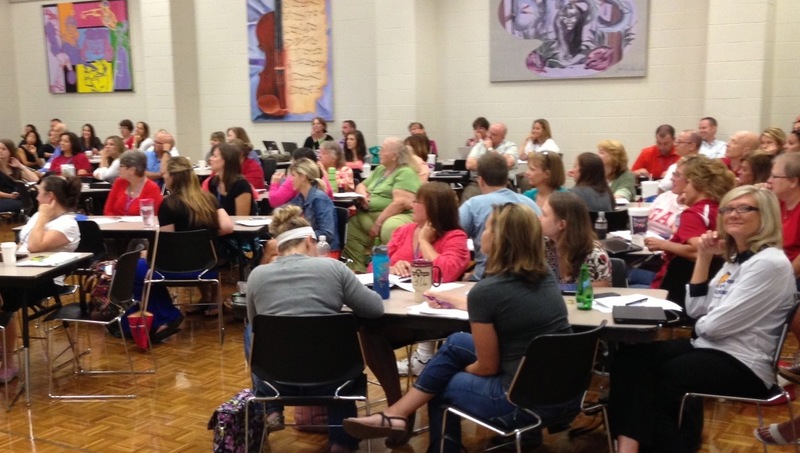 Dr. Jeff Butts, Superintendent of MSD Wayne Township amplifies his teachers' voices this way. 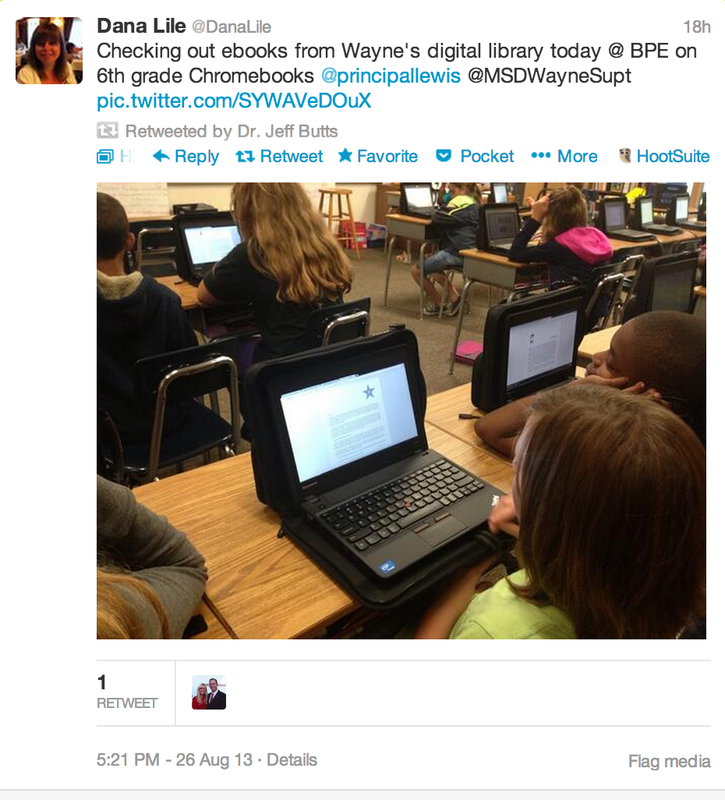 Dr. Butts also uses Twitter to keep his followers informed on state and local news stories that impact education. While others directly show how they are advocating for students. Flora Reichanadter Superintendent of Franklin Township Community School Corporation provides a nice example of this. Others used Twitter as a platform to encourage more community connections by highlighting events and activities. 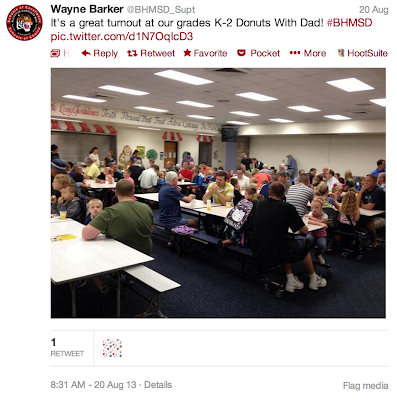 In Bluffton-Harrison Metropolitan School District, Superintendent Wayne Barker tweeted out about Donuts for Dads. And we'd remiss in not showing how Dr. Stacey Schmidt of Porter Township School Corporation tweets out resources she uncovers for colleagues and families of her students. The first round of eLearning Admin Academies spurred many superintendents to create a Twitter profile as part of their shift in school culture. Even more followed after hearing national leaders (and even a few Canadians) dispel myths about using social media and advocate for educational leaders to model its use during this summer's second round of academies. Are you asking yourself, how do I get started? The superintendents featured here, many other district leaders and the building principals on the list IN Admin are resources. Are you a Connected Educator using Twitter? 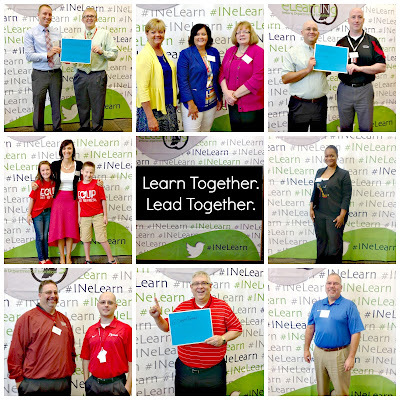 We encourage you to be on one of our INeLearn Twitter Lists so that others can connect with you. All it takes is a minute to submit this survey. When I was a student teacher (almost 20 years ago), my supervising teacher shared with me her practice of beginning the year with an informational scavenger hunt that got students up and learning about one another on the first day. The way this activity helped establish a positive culture with a new class made it an instant favorite that I repeated every year I taught. The start of school comes with many such traditions that we have repeated and solidified over the years. And while these traditions contribute to the strength of our education system, they can also be the very thing that holds us back. 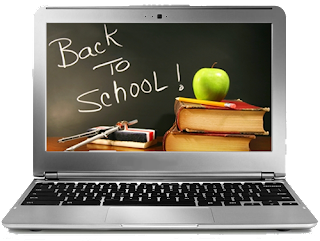 If you do an image search for "Back to School" you would have to conclude that these traditions have much to do with chalk dust, musty books and freshly sharpened pencils. Does our familiarity with these very materials hold us back from employing the tools of a new generation? 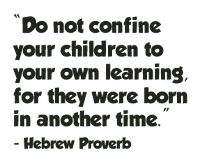 This was a concern of the National Association of State Boards of Education (NASBE), last year when they published their report: Born in Another Time. Among their recommendations, NASBE points out that students need "real-world experience with technology in a way that prepares them to be college and career ready." This isn't just 'time in the computer lab' we're talking about here. They specifically charge us to "ensure that every student has adequate access to a computing device and the Internet at school and home." In Indiana, we've made huge strides in this - by many measures leading the nation. We have a long way to go. To achieve even the goals set out in this report, we will need to take a hard look at our focus, and maybe... our posture. Dr. Scott Robison, the accomplished Superintendent of Zionsville Community Schools put it very well when he said that our job is "helping Indiana’s youth (and their teachers) lean forward into the possibilities." As you begin the new adventure that this school year provides, will you be leaning forward into the possibilities? Or will you be reclining in the time-honored traditions of our past? Will you be the teacher that tries posting a video to reinforce your most important lessons? Or will you be using your overhead projector to cast a tired image of your syllabus on that new interactive board that you just haven't explored yet? Will you be the leader who explores the power of social media to engage your community, or will you protect the past by ensuring that "devices are off and put away." My sincere hope is that all of us who would call ourselves educators would lean forward with the posture of a learner. It is an exciting time, and we all have much to learn! Make it a great year. Everything is shifting at Lebanon Senior High School! When students return next week, they'll not only be greeted by a beautiful new facility, but also their very own MacBook Air. 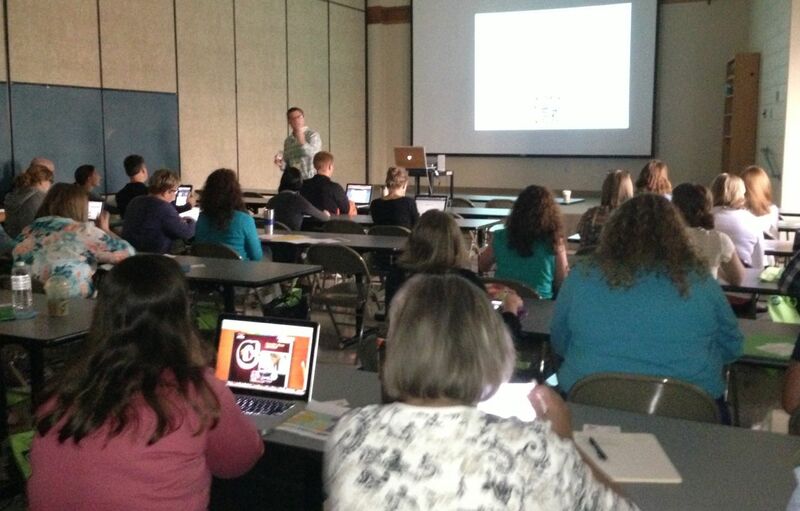 Teachers prepared for this Digital Shift by attending a fantastic conference that bears the same name. Sessions specifically geared toward using these new devices on a day to day basis, equipped Lebanon educators (as well as guests from 50 districts) with a new skill-set to help them make the shift and thrive in this new environment. Dr. Heidi Hayes Jacobs, perhaps best known for her work with curriculum mapping, was an excellent keynote and a great inspiration for helping schools make the changes they need to stay relevant. In recent years she has helped to develop and share Curriculum21, a clearinghouse of resources to help educators transform their curriculum. Stimulating new thinking in so many areas, Dr. Jacobs told participants, "I'd like to eliminate every committee you are on." Rather than meeting consistently when it may not be needed, she says schools should be asking: "Who are the best people to bring together to solve this problem?" This responsiveness to needs and opportunities is also present in her philosophy about integrating technology. With so many tools at our fingertips, she urges educators to create avenues for students to engage in meaningful, globally connected work. 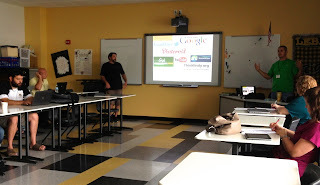 I also attended a great session called Discover, Collect and Create, presented by Joey Till and Justin Vail who have the experience of being 1:1 with Macbooks for the past couple of years in their district, Wabash City Schools. They've curated some great tools to help teachers make sense of the digital world and present them in three categories that essentially break down to: finding things, organizing things, and making things. Their full slideshare for this workshop is available on their website: Eduation Shift. 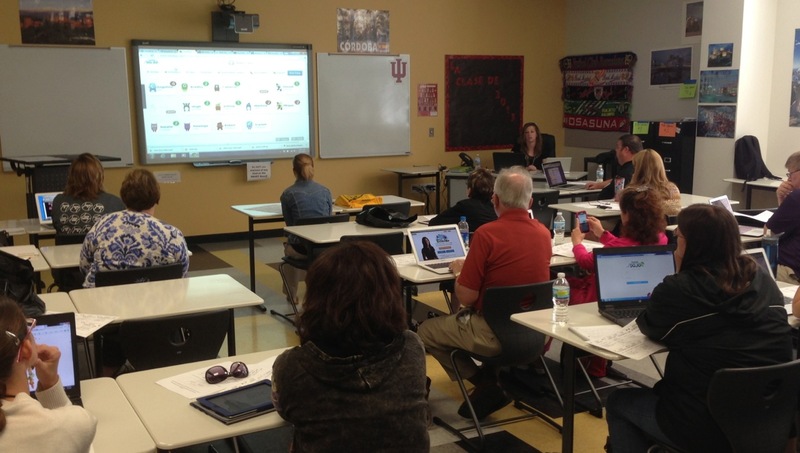 Thanks to Justin for giving a shout-out to the #INeLearn Chat happening Thursdays at 8pm EST. You can also find more from these two on Twitter under the handle @ED_SHIFT. I also have to give additional kudos for the great culture evident at Lebanon. Joining me in each session were members of a fantastic student team, learning alongside their teachers, cataloging great ideas to share with their teachers and peers. Such empowerment is bound to make their upcoming school year an exciting one to watch! 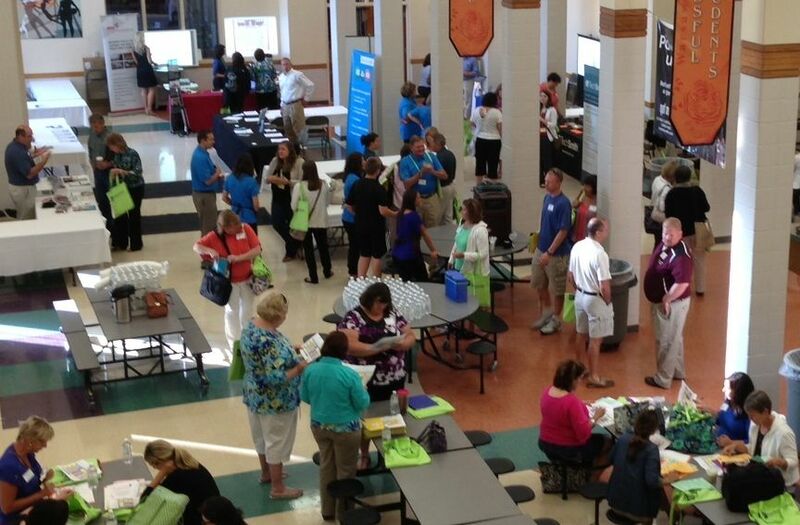 Stop #16 on the Summer of eLearning tour is the eVisionary Conference hosted by Valparaiso High School. 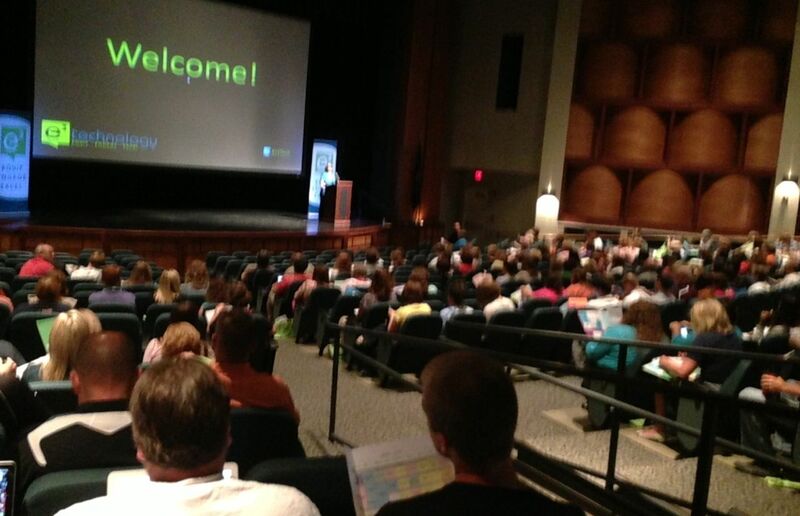 This is the first year for this conference and over 500 educators were in attendance!! The day started with 3 hour workshops on a variety of topics. I decided to attend Leslie Fisher's iOS session. If you've had the opportunity to be in one of Leslie Fisher's sessions, you know she is phenomenal! It was so great to hear "WOWs" and giggling when teachers learned new tricks. Some new things I learned were how to split the keyboard on my iPad (put your two fingers in the middle of the keyboard and drag out...drag back in to put it back together) and how to add the emoticon keyboard to my iPhone. After about a half an hour of tips and tricks, Leslie moved on to sharing several apps that would be helpful to teachers in the classroom. Some of these were Dropbox, Haiku Deck, a new broswer called Dophin, and Remind101. She also shared what she thinks is the coolest app for education, InfuseLearning, a free student response website which students can access from their computer, tablet, or phone. There were some great questions and comments from the group. As always, Leslie was informative and entertaining! The theme of the afternoon for me was internet safety. I first attended "Digital Citizenship in the 21st Century Learning Environment" with Jeanie Sienkowski, MS language arts teacher, and Andy Sargent, MS assistant principal. Their school saw the pressing need for digital citizenship instruction when they had an incident at their school and started with adding school policies and moved to student convocations with FBI agents. Since then their district has created a technology curriculum committee and they are utilizing ISTE NETS standards, specifically standard 5, digital citizenship. Their goal is to create digitally responsible leaders. Jeanie shared her digital citizenship survival guide, which she found on Pinterest. Some resources she uses are Common Sense Media, Twitter, Pinterest, Edutopia. A big takeaway from the session for me was that we are not just teaching our students to be good digital citizens from 8:00-3:00 on school days, but all day, every day! Next, I attended a session on internet safety and cyber bullying presented by Beth Kreppein with the Chicago Division of the FBI. Beth discussed cyber bullying and the amazing statistics of how many students have been bullied online. Some tips that she had for students who have been bullied online are do not seek revenge, do not respond, save the evidence of cyberbullying, report threats of harm, and prevent communication. A great resource that she shared is cybertipline.com. The 2-day conference ended with a keynote address by George Couros. Many conferences participants also got attend some of his sessions earlier in the day. George shared some great things that are going on in his school district, some phenomenal ideas of how to get ourselves and our students connected, but, most importantly, getting to the why of connecting. George ended the day with an inspiring video, encouraging us to move out of our comfort zone and jump in! 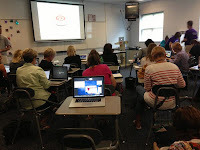 The Summer of eLearning has been all about connecting and learning with educators and administrators around our state, so visiting Zionsville High School for the Get ConnectED conference in our last week was perfect! Zionsville, in collaboration with the Central Indiana Educational Service Center (CIESC) welcomed everyone with delicious cinnamon rolls and conversation in the freshman center. The room was abuzz while attendees and presenters planned out their day of learning. We moved to the Performing Arts Center, a beautiful facility, and settled in for the keynote. 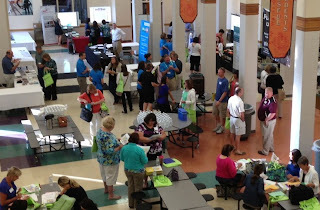 Zionsville Superintendent, Scott Robison, welcomed and invited everyone to a great day of learning and connecting. Zionsville administrator Dan Layton and STEM coach Sara Hunter introduced the Queen of Connection, Sheryl Nussbaum-Beach, as the keynote. 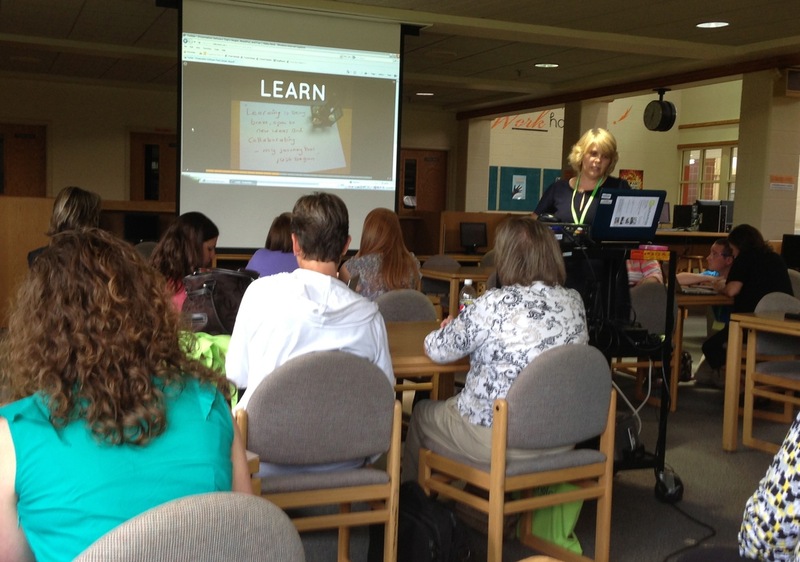 Sheryl brought her expertise as a classroom teacher, technology coach, charter school principal, district administrator, university instructor and digital learning consultant to Monroe County last week as part of our summer series of conferences. As the co-founder and Chief Executive Officer of Powerful Learning Practice, Sheryl works with schools and districts to re-envision their learning cultures and communities through the Connected Learner Experience. 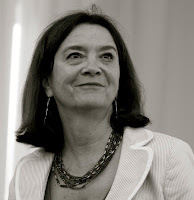 She is the author (with Lani Ritter Hall) of The Connected Educator: Learning and Leading in a Digital Age. Sheryl started right out providing ways for the audience to connect with each other during her presentation in a Today's Meet backchannel and to her presentation in the PLP wiki. Her mantra for the day: We are stronger together than we are apart. Her presentation focus: What are you doing to contextualize and mobilize what you are learning? How will you leverage, how will you enable your teachers or your students to leverage-collective intelligence? Sheryl made a powerful case to be a learner first and an educator second. If you want to grow as a connected learner get connected with Sheryl! Connections continued in a variety of sessions being offered after the keynote. I opted to join Kim Hendrick for her session on "Cool Tools to Curate Digital Content." Kim framed the session around how our learning life can be made simpler with good tools for curation. Kim made the learning easy for all of us by sharing the cool tools from her session in Today's Meet. Check it out to find ways to curate your content! Kim is an outstanding resource for any educator or administrator wanting to connect around teaching and learning in the digital age. Find out more about her and get more resources by visiting her eDesk. Jason attended a presentation by Sara Hunter, Ryan LaPlante, Kelly Masters, and Stephanie Compton; four STEM experts from four elementary schools who shared their secrets to 'Ignite the T in STEM.' The four have collaborated to post resources on a webpage they created. If you've been wanting to get your students started with coding, you'll find some great first steps among these resources. If you are a Symbaloo user, you'll also want to add their web mix of tools to keep them at your fingertips. Today was also a great day for the conferences in the Twitterverse. While participants from Zionsville tweeted to #gcED13, educators at Plymouth sent enough messages on #pcsceQuip13 to cause their hashtag to be a top Twitter trend for most of the day! Tweets also rolled in from Valparaiso who kicked off their conference today - follow us tomorrow as we blog with them from #eVisionary! eLearning Administrator Academies have been embedded in five of the Summer of eLearning conferences in the form of a learning strand. Today, Plymouth's eQuip: 'Hit Refresh' conference hosted the sixth event by reserving an entire day for those in the role of educational leadership to learn together in four sessions specifically designed for their needs. George Couros, the Canadian school administrator who started up the Connected Principals blog and speaks internationally about his passion for Networked Leaders, opened the morning with his talk, "Focusing on Your Why." Couros addressed 40 Indiana administrators, sharing a three step approach to being transformational with technology: Model. Learn. Humanize. The first hour was rich with change-leader quotes, videos demonstrating Couros' points and real-life examples that provided context to the message as Couros laid out the groundwork. Then the energy of the room shifted. It was time to begin interacting and working to answer the big question, "How do we move from 'pockets of innovation', to a 'culture of innovation'?" Attendees dove into the resources Couros provided in a Google Doc and exchanged ideas in small group discussions and over Twitter. One of the resources shared was this blogpost on "Building the Culture of an Empowered Mindset Towards Technology Innovation." The afternoon ended with Couros guiding leaders on narrowing their field, fostering entrepreneurial spirit, and moving forward in change. Tomorrow, 300 additional educators will join these educational leaders as Plymouth's eQuip 'Hit Refresh" goes full throttle. The Tech Playground opens for exploration with student guides available for support. George Couros returns to keynote in the morning. And a full schedule of educator-led sessions including special guests Dean Shareski and Alec Couros offers something for everyone. If you didn't register to attend, you can follow the learning by searching Twitter for #pcscequip13. Five cities, five conferences, five days! 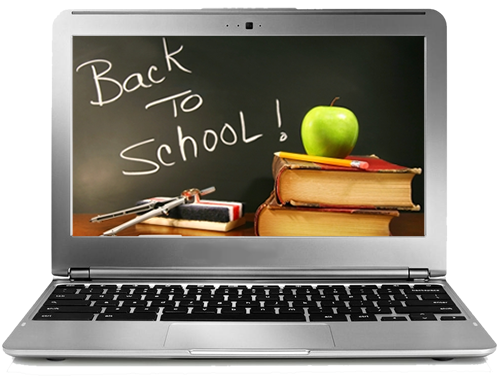 Such is the whirlwind finish to the 2013 Summer of eLearning. And the E3 conference hosted by Warsaw Community Schools was an amazing way to start the week. Will Richardson packed their beautiful Performing Arts Center for his conversation about the impact that abundance is having on our school environments. At this point, I think we have to make Will an honorary Hoosier, as he has taken his 'Summer of Confusion' tour to 5 of our conferences! Down the hall, the cafeteria was equally full with some vendor partners setting up booths and chatting with a crowd of excited educators. The energy of these attendees is a testament to their passion for learning and completely dispels any stereotype of glum teachers just days from returning to their classrooms. In the first session, I joined Ben Rimes, the Tech Savvy Educator from St. Joseph, Michigan. His session, '6 Ways to Tell a Story Without a Pencil', pointed participants toward the Center for Digital Story Telling, as well as his excellent list of Story Telling Platforms. After seeing his great examples, I can't wait to turn my 9-year-old loose on Storybird! Ben also did a great demo of StoryKit which is a free story telling app for the iPad, allowing kids to draw and record audio to enhance and publish their stories. Candice joined Warsaw kindergarten teachers Carla Milliman and Gina Courtois for an informative session on how they use iPads in the classroom. They shared some great Apps like: Bugs and Bubbles, Mini Adventures - Music, My A-Z, and Number Bonds. They also had excellent tips on iPad management, app organization, and student engagement. Most importantly they reminded everyone that iPads should not be a reward AFTER learning but the way students ARE learning all day. Connect with these ladies for more ways to use the iPad. Warsaw PLC coach, Lorinda Kline, led a great afternoon session that ushered dozens of educators across the threshold into Twitter. With spectacular pacing for the audience of Twitter newbies, Lorinda celebrated each tweet that found its way into the twitterverse, and each egg that hatched into a beautiful picture. I love seeing these conferences bring new people into the conversation, because despite the massive audience on Twitter, educators are still vastly underrepresented in their numbers. For those of you now looking for others to connect with in this space, we hope you'll join us in tagging your learning with #INeLearn and follow @INeLearn to stay up with the great things happening in Indiana - great things like #e3Tech! Today, Jason and I stepped off the Summer of eLearning Trail to join over 300 educators from 22 states gathered in Indianapolis for the National My Big Campus (MBC) Users' Conference. These passionate teachers, coaches, and administrators joined together for two days of learning the many ways My Big Campus can be used in their classrooms, schools, and districts. The morning opened with a lightning round of presenters from California, Michigan and Georgia sharing excellent MBC projects in their states. Indiana was also well represented by a number of presenters and projects. 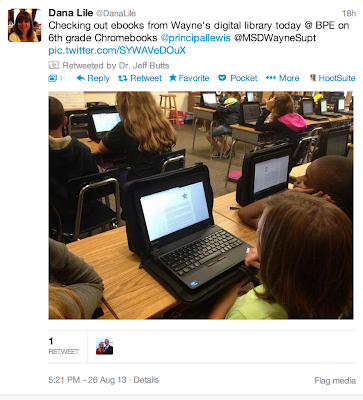 Pete Just and Michele Eaton from MSD Wayne shared about the creation of digital content through the MBC Bundles. 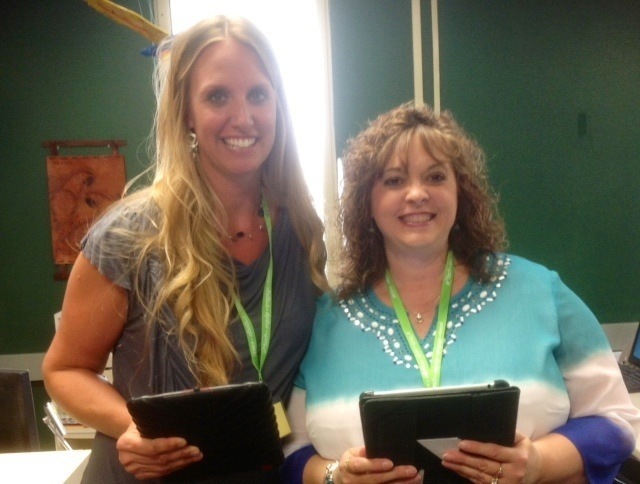 Jennifer Watson from Madison Consolidated flipped a fifth grade using MBC, while Karen Diggs from North West Hendricks School Corp. not only flipped, but also used MBC for delivering a Drivers Ed course and Exam View assessments. Finally, Anita Hershman from North Judson assured us that you can teach old teachers new tricks with the ease of My Big Campus. It was a truly special day for us, as Joel Heinrichs, CEO of Light Speed Systems parent company of My Big Campus, presented the Indiana Department of Education with the Innovation in Education Award. The award honors school districts and educational agencies that exemplify innovative educational practices. A big Hoosier Thank you to Light Speed and a even bigger CONGRATULATIONS to Indiana teachers and administrators for leading the nation in this exciting and challenging work of learning in today's digital age. The two-day conference was jam-packed with learning, sharing, and true collaboration. If you want to find out more, search and join the group, My Big Campus User Conference 2013 inside My Big Campus. Providing educators the "Tech Java" they needed first thing in the morning, sixth grader Matthew, an eLeader at Oak Hill Elementary School in Evansville, opened #GCCC13. Matthew's "Did You Know?" presentation from the student perspective was declared #EDUawesome! Matthew received a round of applause when he said that kids are tired of testing, and he kept the audience's attention all the way through to his real message, "I'm here to encourage you to be a fearless learner like I am." Before turning over the stage, Matthew assigned conference participants homework. The first task was to begin using Twitter and the second was to provide feedback on a Padlet Matthew created for that purpose. You can watch the talk here thanks to TeacherCAST, that broadcast the morning keynotes. Matthew's advisor, Delyn Beard introduced him and the work of the eLeaders, which you can learn more about here. Ms. Beard, @delynbeardon Twitter, will be checking the homework Matthew assigned. Quick to note that they had a hard act to follow, classroom teachers Nicholas Provenzano and Tim Gwynn shared their stories of becoming Connected Educators. Provenzano, who spoke about his journey from being teacher-centered in the classroom to becoming student-centered, echoed Matthew's opening message adding, "We need to encourage teachers to take risks; to be innovative." Gwynn spoke about the benefits he's received from connecting with other educators after first approaching teaching as an independent or "I can do it on my own" kind of learner. The audience enjoyed being privy to Gwynn's 2009 Twitter confessions as he demonstrated his transformation from posting humorous tweets to recognizing the potential of Twitter as a learning tool. He noted the importance of embracing this culture of sharing. "As I become a better professional, my students become better people," Gwynn closed. Like all of this summer's conferences, GCCC offered strands to organize the learning being offered. Attendees could select from Innovative Learning Models, Learning in a 1:1 Classroom, Nuts and Volts of a 1:1 Classroom, the Digital Tool-belt or Digital Leadership. Choices were difficult and there was a mix of highly popular beginner sessions and smaller, more personalized sessions. There was no shortage of national and local speakers sharing their learning and modeling connected learning. Since The Nerdy Teacher, Nick Provenzano, shared that one of his first "Twitter godparents" was Shelly Terrell, who happened to be at #GCCC13, we decided to learn from her too. Her session "Sharing Stories: Powerful Lessons in Digital Storytelling" was hands-on. She walked participants through creating a story cube using resources you can access in her presentation Google Doc. Shelly cautioned that students may be hesitant to engage with these types of activities in the classroom because they've not historically had opportunities to be creative in this way at school. She talked about our responsibility for showing students how learning is all around them and how technology makes sharing that learning possible. Congratulations to Brett Clark and his Greater Clark team for organizing their first regional conference! eLearning rocks at Digipalooza! Scott County School District 2 chose a fantastic theme for their conference and used it to make teachers feel like they were at an awesome concert complete with a backstage pass! 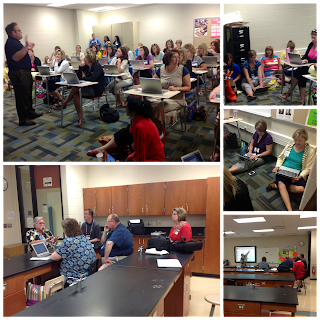 That access included some tremendous learning in keynotes and sessions. 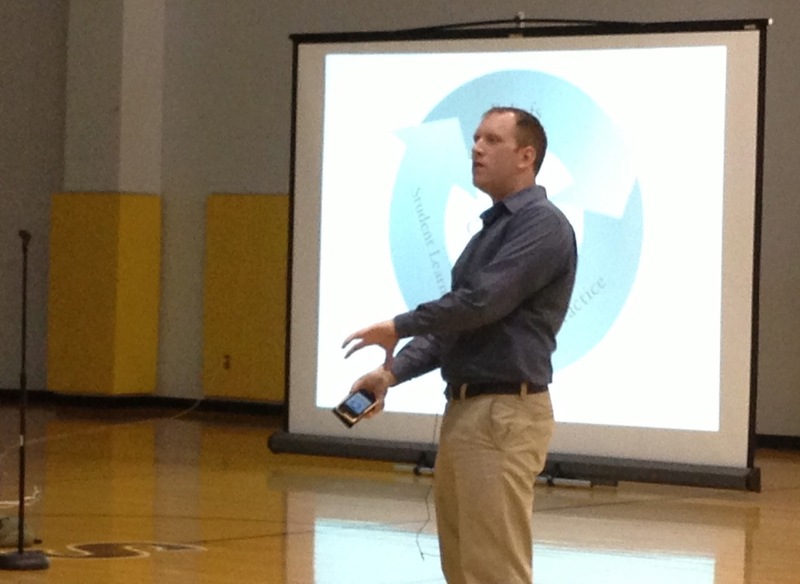 Wednesday's keynote rockstar was Jason Roseberry, Director of eLearning for Five-Star Technology. Unlike so many speakers who highlight the barriers to digital education, Jason did a great job of focusing on solutions. An expert on professional development, he pointed out the need to embed good professional development within the context of teaching and learning, rather than relying on stand-alone sessions. 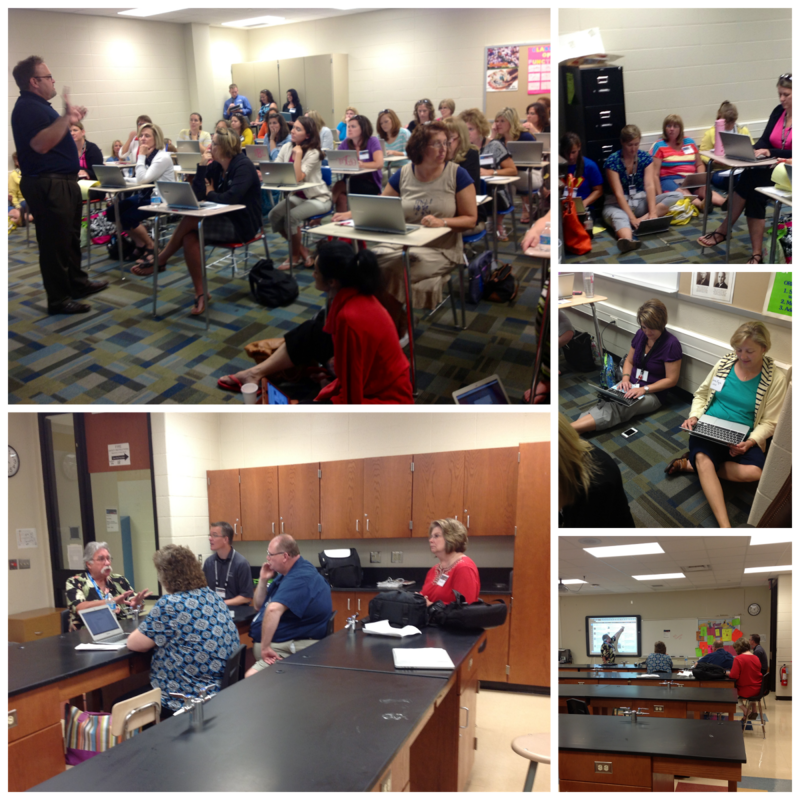 A full house of educators joined Scott 2 teachers, Chris Routt and Beth Walton to explore uses of Pinterest in the classroom. They shared photo journals, content projects and evidence of learning. Mollie, a Scott 2 student, also joined the presentation to show how she was able to evidence her learning around a famous American by pinning a board on Amelia Earhart. Mollie shared this was a more interesting way to share her learning. Pinterest is a great place to connect with other educators and share great ideas for teaching and learning. Look for more ideas on #digi13 and our own Pinterest boards. In his session, Yancy Unger shared some great ideas about school change by comparing the way we think about competence to other fields, sharing some clips from Gordon Ramsay's show Kitchen Nightmares. Seeing how some restaurant owners were unable to hear criticism and recognize their own shortcomings, it is easy to imagine how difficult it is for us in education to own inadequacies in our practice. Yancy pointed out that this overestimating of our own capacity, and underplaying our weaknesses actually has a name and field of study: Illusory Superiority. Micah Heath, Principal of Vienna-Finley Elementary School, shared how he uses a school Twitter account to share pictures and video of student activities. In parallel, he also maintains a Vienna-Finley Facebook page and Pinterest Board. His tweets and posts go a long way toward connecting parents to the school and informing them about events where they can get involved. Micah also shared some great Twitter resources like 7 ways to get more out of Twitter and 100 Scientists 140 characters away. Today brought our Summer of eLearning tour to Bloomington, a town well known for fantastic learning experiences. This week was no exception, as the Monroe County Community School Corporation hosted a five day learning summit diverse enough to truly be a 'Full Court Press on Learning.' Their speakers included Michael Fullan and Robert Marzano, and topics such as literacy, comprehension, engagement, and the many factors of change impacting teaching and learning. 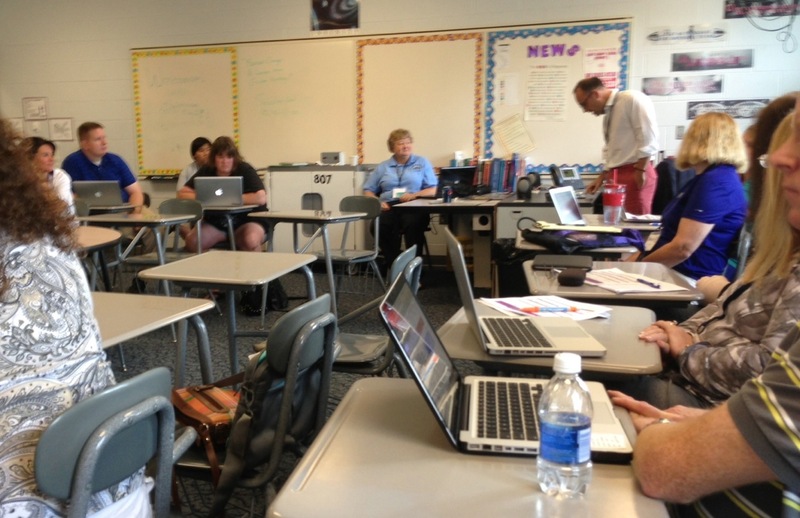 Tuesday engaged hundreds of educators in three main spaces at Bloomington High School South. In a large meeting room, Dr. Tammy Heflebower, vice president of the Marzano Research Laboratory spoke about the important aspects that create a highly engaged classroom and shared great strategies for creating such a space. 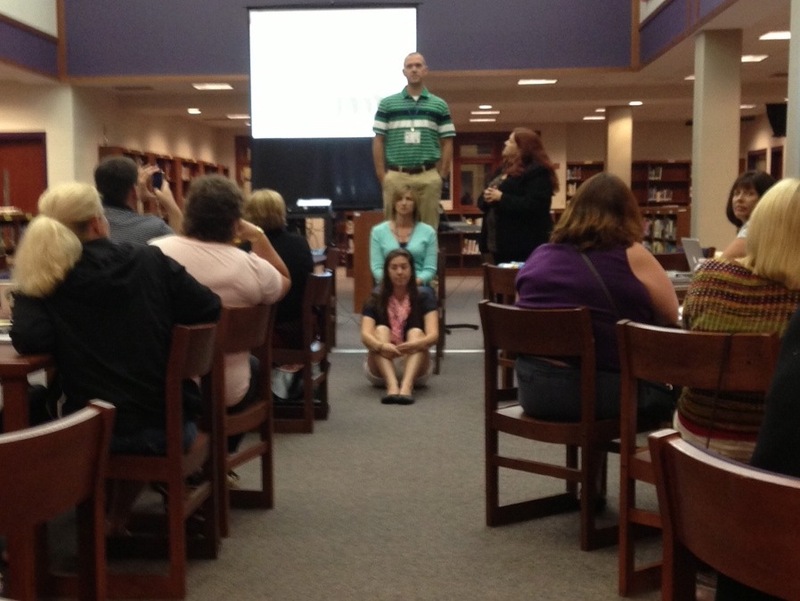 Next door in the auditorium, Dr. Tim Rasinski led a group interested in improving their students' reading ability. His session on word study and fluency shared approaches to assess and monitor key components of reading. In the Media Center, Sheryl Nussbaum-Beach led our group in a presentation focused on unleashing student passions by leveraging the tools of the 21st Century. Sheryl is well known for connecting educators through her Powerful Learning Practice. Like her opening physical demonstration (photo left), Sheryl's session did a great job of showing us the value of sharing our perspective and seeing how it fits in the tapestry of the education community. If you haven't seen it, check out the Connected Learning Manifesto she posted. Among the other resources Sheryl shared, she pointed math teachers to a couple of valuable blogs written by connected leaders: Darren Kuropatwa and Dan Meyer. Like Sheryl's presentation, the great thing about Bloomington's Learning Summit is that it is connected, in many ways. For participants, the technology doesn't exist at a separate conference, but is connected to learning about literacy and enagagement, and all the other things that are important in our classrooms. Thanks to Jason Taylor and the team at MCCSC for organizing this massive learning experience and sharing it with Indiana educators!